Michael and Teresa have been observing and photographing the black bears along the tracks of the Toonerville Trolley in the Upper Peninsula of Michigan for four years now. The Tahquamenon Falls Riverboat Tour/ Toonerville Trolley Wilderness Ride has been in business for 85 years. Throughout those 85 years the proprietors have put out ‘treats’ along a three mile stretch of the 24 gauge train tracks. The intelligent black bears have a great memory when it comes to a food source. 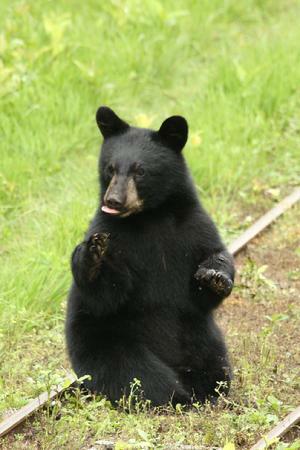 Black bears prefer berries, nuts and insect larvae as a main food source. But when sweet treats and meat is available they will indulge themselves. 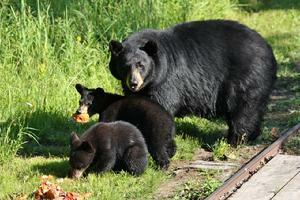 These black bears do not associate ‘people’ with food but they see the train as their food source. The owners and the McGills know that it would be bad for the bears to think that people are the ones providing them with the treats. The bears would then think every human should contribute to their food source. Michael and Teresa want to help educate people to the behaviors and habits of these beautiful gentle creatures. Black bears are basically non-aggressive. Even when a bear stands on its hind legs it is usually to get a better look at what is approaching. Black bears have good vision for things up close but their distances vision is lacking. They make up for it with their keen sense of smell which is 100 times stronger than a human’s along with their great hearing. So they usually smell or hear trouble (or you) before it gets too close. People don’t realize but the black bear is more afraid of you than you are of it. Unless forced due lack of food source, the black bears will keep to their territories. Unfortunately, dry weather, forest fires etc. contribute to the need for the bears to wander into ‘human’ territories to seek food. The black bear’s number one concern is food! When it is not readily available they have to seek it elsewhere. One of the key things NOT to do is feed bears!!!!! Once the bears are given food by a human they will continue to expect it from all humans. That’s when they become a nuisance!! They will wander into neighborhoods looking for handouts. The young will become dependent on people instead of their own instincts to feed themselves. So please…if bears do come into your area…take down the bird feeders…batten down the trash cans lids…and DO NOT give them anything. They will eventually leave and search other areas. The last thing anyone wants is to relocate or especially kill a black bear!! Momma bears with young may be especially vulnerable to the ‘easy pickings’ found around humans. Please do not think these adorable cubs are to be touched!!! Momma will tolerate a lot but still do not give her cause to approach you. The cubs shouldn’t be taught that it’s ok to touch humans either. Common sense is important when dealing with an encounter with a black bear. First, make your presence known…the next thing would be to use an air horn as a deterrent when a black bear approaches. The best defense when one is going to be out in the wilderness is a can of pepper spray. It is THE best defense against any critter. The spray will cause the animal to not be able to see or breathe for a short period of time. They will quickly leave and, due to their great memory, will most likely not approach a human again!!! A gun is the last resort! Like any wild creature there are ‘rogues’ so always show extreme caution and always be prepared when out hiking and biking. You are in their homes…respect their space…know their habits…know their behaviors and what they are trying to communicate to you. Black bears hibernate due to lack of food source in the winter rather than because of the cold weather. The longer the growing season for food is in an area the shorter the hibernation time. The black bears breed in late May and June. The female can ‘delay implantation’ until she knows she is going to be able to have enough fat stored up to keep her and her cubs sustained till Spring. A nursing black bear will lose up to 1/3 of her body weight in the den. The black bear usually has two or three cubs born in January/February. When they come out of hibernation the cubs are 2-3 months old and about 5 pounds. The momma has to feed on tender grasses and leaves to jump start her metabolism. She will nurse her young most of the summer but as soon as their teeth come in later in the spring they will also eat berries and bugs like momma. Mommas are very cautious around the male bears during breeding season. Males will kill the cubs in order to breed the momma bear. Black bears will usually have their first cubs at 3 to 4 years of age depending on availability of a good food source to help them mature. The next spring the momma will keep her yearling cubs with her till breeding season. At that time she kicks the cubs out making them fend for themselves out in the cruel world. Sometimes once the female has been bred she will allow the yearlings to stay with her. But by fall they are left to their own devices. Some of the mommas like humans will allow their young to stay near them throughout their lives. 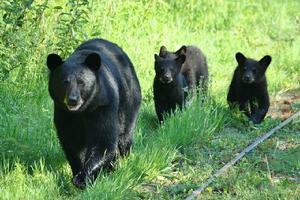 Black bears in the wild will generally live 20-30 years. One of the matriarchs from the tracks of the Toonerville Trolley actually let one of her grown daughters eat with her. Just like people the animal kingdom has good parents and bad parents. The McGills are fascinated by the correlation in many of the behaviors of bears and humans. That is what makes what they are doing so rewarding. The McGills feel very privileged to be able to observe these beautiful mammals up close and personal without the bears’ knowledge. 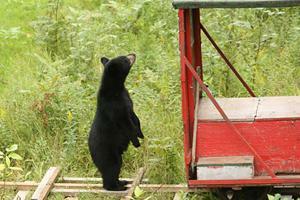 Thus getting peeks into the lives of the black bears of the Toonerville Trolley that most would never see. The photos above are Momma Goofette and her first cubs, Ole and Lena. These were the first black bears that the McGills photographed along the tracks of the Toonerville Trolley. The one on the right is little Lena enjoying her pb&j. The photos blow are Momma Goofette on the left and Ole on the right checking out our speeder.